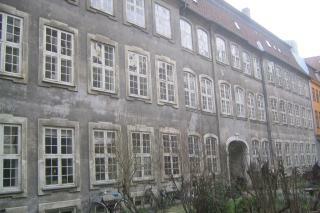 The Harboe Home for widowed women of rank was built in 1754-60 on Stormgade in Copenhagen based on plans by General Master Builder Lauritz de Thurah. Funds were willed for the project by Privy Councillor Christine Harboe, née Fuiren. The home comprised free lodging for 13 widows of men from the higher echelons of society. The original building consisted of two three-storey pavilions connected by a lower, two-storey gate wing. In 1772-73 architect Caspar Frederik Harsdorff raised the gate wing to the level of the pavilions. Harsdorff did not change Thurah's charming baroque-style facade, however. Initially, the building was flanked by two entrance gateways but they were converted into housing in 1874. Even good families sometimes needed help in the 18th century. There was no social safety net back then. It was every man for himself. Upper-class women were especially badly off if they were not married. Without a breadwinner, they had no financial security net. The charter for the Harboe Home therefore also stated that the home for old people was to offer free lodging for 13 poor and God-fearing widows whose husbands had served in one or other of the charges introduced in the five classes of the royal rules governing rank and precedence". Privy Councillor Christine Harboe was by no means the only wealthy woman who spared a thought for her high-ranking sisters. A series of similar homes were built during this century. They were intended for unmarried women or widows from the ranks of nobility or the higher echelons of the middle classes. "